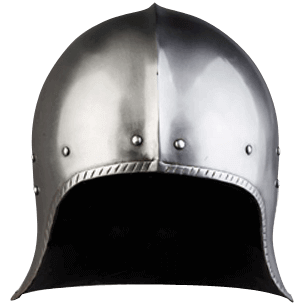 Worn by soldiers across Europe during the 15th century, the Franz Steel Open Sallet is built without a visor for unhindered vision and breathing. This rounded steel helmet has a slight rear flange to protect the back of the neck. This handcrafted helmet sports a close-fitting design with a slight ridge across its rounded skull, adding not just interest but strength to its overall structure. Rivets encircle the crown of this steel helmet, and its edge features decorative corrugation all around for extra detail. While the inside of this open face sallet helmet has a cotton covered foam inlay, we recommend wearing a padded arming cap underneath for better safety and comfort. 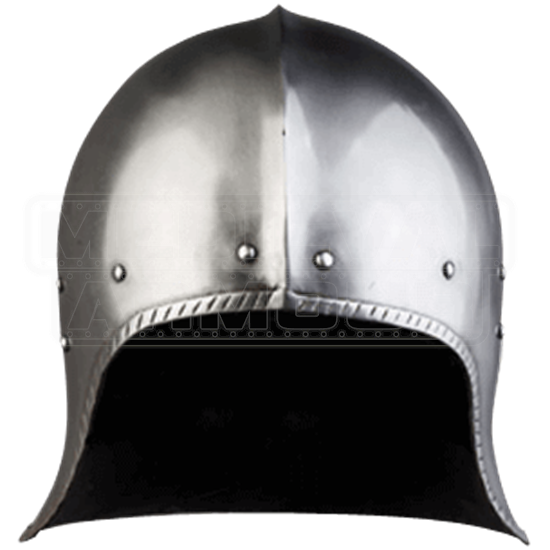 Top of your armoured outfit with the Franz Steel Open Sallet, a great addition to both medieval and Renaissance-inspired costumes and LARP ensembles.